Whenever you “focus” something (like a solution) without using an optical lens, or “scale” without using a ladder or stairs, or consider “small steps” without moving your feed, you are using metaphors already. Metaphors are inevitable: research claims an average of six metaphors per minute in any average conversation! Metaphors carry meanings over from one domain of experience to another. They surf on the edge of similarity and difference and help to understand the unknown (like ways towards solutions) by creative application of the known (like some features of the complaint). Metaphors build bridges between feelings and thoughts, images and words, right brain and left brain, problems and solutions. They are paths as well as maps to our “mindscape”, and have been systematically researched and applied from neurology to epistemology, from therapy to marketing. This workshop invites, in a playful way, to more consicously use metaphors in co-creating solutions with clients. It offers several direct ways of accessing metaphors as “deliberate detours” as well as “shortcuts” circumventing obstacles on the way to solutions . Everybody attending can work on their own topics, and explore their own metaphors, simultaneously, and interactively – and with lots of fun. 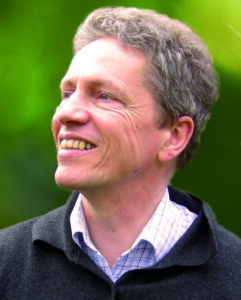 Klaus Schenck, Ph.D., is a regular contributor to the SOLworld discourse and has attended most of their conferences since 2003. All his professional activities have been inspired by the practice and the attitude of “solution focus” since he first met Insoo Kim Berg in 2001. Besides, obviously, being a big fan of the application and benefits of metaphors in understanding “life, the universe, and all the rest”, he works as a management coach, project management improvement expert, psychotherapy practitioner, agile facilitator, conflict mediator, teaching level certified “systemic consultant”, academic lecturer for a range of management topics – and as occasional photographer at SOLworld events. Until 2003, he worked as product and innovation manager in the medical device industry and, until 1990, as molecular biologist in the German Cancer Center, as taxi driver, and as part-time IT-operator.